Until only recently, the 2016 Hyundai i30 was the biggest-selling car in Australia. But, after a wind-down on strong deals, the i30 has fallen back beyond Toyota’s Corolla to sit in second place year-to-date. That only serves to prove the landscape can change in a ‘motoring moment,’ between the time I write this and you read it, for example. Or, in the case of comparing Hyundai’s sales juggernaut against the 2017 Kia Cerato, the goalposts have shifted between testing cars and writing up this comparison. Why? See, we pitted the base i30 Active Auto against the entry-level Cerato S Hatch Auto back in June. At the time, you could drive away from showroom floors of either automatic-equipped Kia or Hyundai for a tenner under twenty grand with nothing more to pay up front. Yes, red-hot value pitches in a massively popular segment, and it was a clean head-to-head shootout at the price-savvy $19,990 corral. Adding heat to the skirmish was that, until May, Kia had only been selling around a quarter (4488 units) as many Ceratos as its Korean cousins were moving i30s (16,425 to be exact) – an amazing stat given that the ageing second-generation i30 is set to be replaced early next year. And thus, this ‘New Cerato,’ as it’s marketed, went straight into the sub-$20k driveaway-with-auto deal from launch in the push to grab some market share. Happy times for bargain-hunters. Then the clock struck midnight on June 30th, the end of the financial year, and pricing changed. 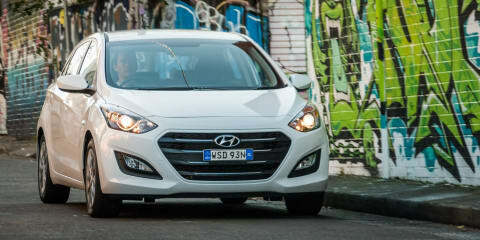 At least, that is, for the base i30 Active, as Hyundai rejigged its offer to $22,990 driveaway with an automatic transmission (or $2000 less for drive-away with a conventional manual gearbox). Meanwhile, Kia has stuck firm with its ‘free auto’ $19,990 driveaway offer for Cerato S.
Understandably, a verdict on a winner among such value-laden pitches passed down in late June would’ve had relevance, literally, for a matter days. Especially where a shift in two grand is a huge 10-percent deviation at this price point. So we’ve given the pair a couple of months for these current offers to ‘bed in’ before reappraising this pair of price-busting five-doors. We recently threw the top-shelf i30 SR and Cerato Si protagonists against one another, both floating around the $28k mark and a stoush where we “couldn’t split the two”, each scoring a strong eight out of 10 in overall rating. Read the full test here. While this match-up might sit at opposite end of the fiscal scale, this is the ‘main game’ that attracts the lion’s share of small-car buyers. Tellingly, both entry models offer compelling packages for very reasonable prices. Newly face-lifted, the Cerato pulls the freshness card. You get revised styling, a revamped interior design, and the whole range’s specifications have been given the once over, more of which you can read about here. Both cars get 16-inch steel wheels, keyless entry, cruise control, air-conditioning, cloth trim, Bluetooth phone and audio connectivity, six-speaker audio with Apple iPod connectivity, rear parking sensors, heated wing mirrors and full-size spare wheels. Where the Cerato S gets six-airbag surety – front and side airbags for the first-row occupants and full-length curtain airbags – the i30 Active goes one better, adding a driver knee airbag. And while the Kia gets front parking sensors left off the base Hyundai’s features list, the latter does come loaded with a 7.0-inch touchscreen infotainment system that includes Apple CarPlay smartphone connectivity. The Kia makes do with a MP3 compatible CD player with old-fashioned push button interactivity. So the i30 Active gets a healthier equipment list for its two-grand premium price. But there’s a big caveat: for an extra $500, Kia will bundle a package into the Cerato S that includes its own 7.0-inch touchscreen system with rear-view camera and automatic headlight functionality. Like the Hyundai, the Kia has no proprietary sat-nav function, though its system is currently Android Auto compatible only. Both cars come in white as standard no-cost colour, with Cerato S available in seven colours and the i30 Active available in six addition metallic/mica/pearlescent hues for an added $520 and $495 respectively. The entry-level Active (and one-rung-up Active S) gets the smaller 1.8-litre ‘MPI’ petrol four-cylinder of Hyundai’s i30 range, producing 107kW at 6500rpm and 175Nm at 4500rpm, which is a significant 17kW and 16Nm down on the direct-injected 2.0-litre four fitted to the high-spec SR and SR Premium versions. With a six-speed automatic as fitted to our test car, claimed combined fuel consumption is 7.3L/100kms, though this figure drops to 7.0L when opting for a conventional six-speed manual. Its Korean contemporary, though, gets a full two litres of engine capacity, though it’s a multi-point-injected rather than a direct-injected unit. It produces 112kW at 6200rpm and 192Nm at 4000rpm, or a modest five-kilowatt and slightly more significant 17Nm benefit over the base i30. The Kia claims 7.1L/100kms for its standard-fitment six-speed auto, though it too has a manual available as an option. While neither car is a powerhouse, each displayed ample energy during our test loop that combined slow-moving urban driving with cruising stints along Sydney’s motorways. Each engine is quiet and reasonably refined, though the torquier Kia feels a little less tasked or has the need to be revved as hard for the sorts of spirited acceleration demanded for overtaking or getting up to speed along on-ramps. Where both cars punch well above their modest 1350kg-odd weigh-bridge tickets is in ride comfort. And, digging a level deeper, both offer a sweetly struck ride and handling balance. Each uses strut front and torsion beam rear suspension arrangements typical of budget-oriented small cars, though both benefit from varying degree of localised input in tuning. And impressive tuning at that. Of the pair, the Hyundai is little better rounded over a variety of bumps and imperfections, a little more resolved, transmitting vibrations for corrugations and thumps from speed humps and square-edged hits with more isolation. 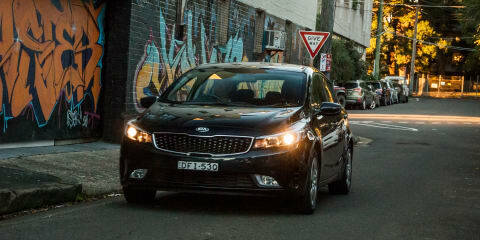 That said, Kia’s slightly firmer settings received in the Cerato range’s recent face-lift, though, haven’t adversely impacted what is an impressively pliant experience, even across some of Sydney’s crook road surfaces. That each car sits on fairly narrow 205mm-wide tyres with cushioning 55-series sidewalls adds a pleasant sheen and feels particularly tailored-for-Aussie conditions. And they’re a damn sight finer and more cosseting than many other small hatchbacks. Each is light on its rubber feet, direct in communication and easy to manoeuvre and punt around the urban confines, though the i30 is little crisper in its connection with the driver. That said, the base Cerato remains the “well-balanced and solid all-round set-up” that was praised back at the recent local launch. They are good drives, though more in fundamental engagement and friendliness than the sort of ‘warm hatch’ sportiness of pricier i30 and Cerato variants. Speaking of which, of this pair, the i30 gets Hyundai’s nifty Flex Steer system, which allows the electric power steering assistance to be set light for low-speed urban driving or heftier for more sporting driving, though its addition to the base hatch with modest performance pretensions, is more novel than introducing useful functionality. And so the similarities continue. If each really taps into an area of genuine sportiness, it’s in the reasonably low-slung seating position that has become vogue in hatchbacks of this size and segment. But it’s the clear and well executed driving ergonomics present in both that not only imparts a sense of connection with the driving experience but lowers fatigue when going for long drives. Outward visibility is good in both cars, if hampered a little by thick drivers’ A-pillars that can obscure vision through right-hand corners. Both have swooping body and window lines that, while not inhibiting front passenger vision much, can limit outward visibility for smaller kids, even those in booster seats, travelling in the second row. Despite lacking the i30’s rear-view camera system, the Cerato is easy to park even in Sydney’s incredibly-shrinking supermarket car spaces. That said, the Hyundai’s camera system with guidelines is large and clear on the 7.0-inch touchscreen and, given neither car is a pillar of all-encompassing rear vision, a bit of a godsend in tighter reversing manoeuvres. At around 4.3 metres in length apiece, neither hatch is particularly compact, so younger drivers of limited experience – key buyer targets for this affordable pair – might find the differences in parking assistance a critical factor in choosing one Korean over the other. Where this pair couldn’t be more different is in interior design. The Hyundai’s long, curvaceous slashes, generous use of plasticky satin silvers, piano blacks and oddment of button shapes is funky and youthful, if becoming a little dated. For pure functionality, it’s a mixed bag: the touchscreen and air-con controls in the central stack are logically placed and easy to find; the fussy steering wheel, though, isn’t the most comfortable or ergonomically friendly out there. The more austere treatment in the Kia cabin with darker, more closely colour-matched greys owes more than a little to Germanic influences and, despite that low-rent audio system, looks quite upmarket for a circa $20K-drive-away proposition. The driver’s instrumentation is clearer and a little more ‘classic’ in design, and the steering wheel is engagingly shapely, though the tiller’s button arrangement is a little haphazard. The Hyundai has the more sport-bolstered front bucket seats, though it’s quite a relaxed design favouring comfort over torso-hugging purpose. They’re a little fancier than the Kia’s, though each car is trimmed in fabrics that are more about hard-wearing durability than they are around sumptuousness. That said, at this wallet-friendly price point, the quality, materials and fit and finish – bar the misaligned dash-to-door trim on the Hyundai – is impressive and testament that affordable cars needn’t necessarily be cheap. For this reason alone, the extra $500 spend on optioning up to the similar touchscreen/rear-view camera bundle in the Cerato would look almost essential… if you happen use a smartphone that’s Android Auto functional (Apple CarPlay is said to be available in future as an update). Given the system isn’t fitted to our test car, the jury is out on its user-friendliness and functionality. The i30’s system, which right now only supports Apple CarPlay, is as quick and slick as that experienced in pricier vehicles fitted with similar systems. The addition of the hardware in the cabin space alone really lifts the level of the base i30’s perceived luxury levels, but it’s the software and suite of app features that really expands the useable and appealing features for an entry-level small car. The standard-fitment Bluetooth systems were adequately quick to pair and easy to use in either car. It would be easy to underestimate how buyers’ smartphone brand allegiances might heavily influence which of two hatches might become the unavoidable choice by infotainment systems alone. Especially when features such as sat-nav are device-dependent and don’t come as a proprietary offering this far down the model ranges. Both protagonists are near equally spacious in the second row, offering levels of roominess comparable to many medium-sized cars. Each are five-seaters though neither really offers much comfort in the middle seating position, such is the shapely hump in both cars’ seat bases and seat backs. The Kia is slightly comfier for adults in the outboard positions, though, as the Hyundai’s headrest tend to poke in passengers’ backs, while the Cerato offers a fold-down centre armrest not featured in the i30. Neither car offers rear air-con vents, though each gets three conventional child seat anchor points and outboard ISOFIX points. Both have reasonably easy-to-stow 60:40 rear split-fold seating arrangements to gain access to the boot space. The Kia does offer a slightly higher 385-litre claim to the Hyundai’s 378-litre figure, though that seven-litre advantage is semantic when loading in any size or shape of payload. The i30’s boot floor is lower and deeper, though, which might better suit squarer objects, though it does require a little more back-bending when loading stuff in or out. The i30 is covered by Hyundai’s five-year/unlimited kilometre warranty with a 12-month complimentary roadside assistance program. However, the Kia trumps this with an impressive seven-year/unlimited-kilometre surety with its roadside assistance extending to the entire duration of the warranty period. In terms of servicing, the i30 comes with a 60-month capped-price plan with intervals of 12 months or 15,000 kilometres, whichever comes first. The intervals range in price from $245 to $345 per service. Meanwhile, the Cerato gets an 84-month capped-price plan with the same 12-month/15,000km intervals as the i30, or a total 105,000km schedule of fixed-priced servicing. The Kia intervals are pricier, starting from $289 and topping out at $487 – although Kia notes that each service includes free replacement of the $59 pollen filter, while every second service sees the brakes flushed and the fluid ($22) replaced, again for free. Both of these features of Kia’s capped-price service program would, for most brands, come at an additional cost. The last time we pitted the i30 against Cerato in high-spec forms it was an “extremely tight” competition, making it difficult to carve out an emphatic victor. So no prizes for guessing that in this, the bottom floor of the Korean face-off, the situation has changed little. The short of it is that we easily recommend either as a fine, affordable first car, last car, only car or cheap-and-cheerful extra runabout for the multi-car family. That they’re so utilitarian for all-round motoring, offering solid drivability, core comfort and useability for so little coin, they make feasible alternatives to many pricier cars of less-humble aspirations. However close they ostensibly are, differences become amplified. And one crucial point is price. Before June 30 this year, when both sat at $19,990 as drive-away autos, you’d have to give the win to the i30 Active for its superior bells and whistles, even if the pair was essentially split by Kia charging an extra (and mere) $500 for stuff the Hyundai already had loaded in. Even now, the automatic-equipped Kia remains a $19,990 drive-away prospect. But as it stands at the time of writing, the Kia fitted with those $500 options asks for just $20,490 on the road against the i30 Active auto’s $22,990 drive-away deal. And that $1500 difference in favour of the Kia hands it the win. Update: Hyundai Australia has since confirmed its September offerings for the i30 Active petrol at $19,990 drive-away for the manual and $21,990 drive-away for the auto.